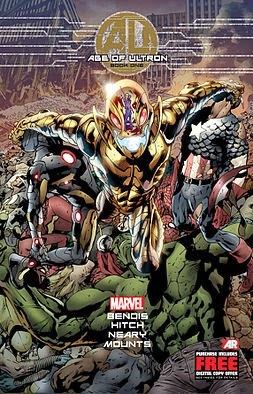 Cover of Age of Ultron #1 (March 2013). Since Avengers: Age of Ultron arrives soon, masked crusaders with superpowers continue their seemingly endless upward trajectory. Of course we’re all looking forward to more Iron Man, Thor, Black Widow, and Captain America. However, we’ve been promised a host of other characters on film, with Deadpool now in the works, Antman coming this summer, and more Guardians of the Galaxy coming in 2017. DC isn’t holding back either. Their Batman vs Superman: Dawn of Justice is promised for quick delivery. The film includes Wonder Woman, who has her own solo project coming up. We’ll see old faithfuls like Lois Lane, played by Amy Adams, and Lex Luthor by Jesse Eisenberg, tapping the A List of talent for the film. Rumor has it there’s an Incredibles 2 being developed. I’d be very surprised if Big Hero 6 doesn’t come back to the big screen in a few years. The X-Men are due to return in X-Men: Apocalypse. (Superheroes seem to like colons in their titles. Right, Captain America: Civil War?) In fact, if you go to CinemaBlend for the latest movie news, most of the upcoming titles on the side bar are about the Supers. Why are superheroes so popular? The blog for ABC News states reading comics and revering caped crusaders used to have a backroom quality or “…an air of disrespectability.” According to the article, it all changed on September 11, 2001. Perhaps that fateful day made us realize villains are real and, even more horrifying, we were alone confronting the threat. After all, Superman himself arrived in 1938, during the escalation of World War II. Maybe our psyches demand something we can look up to or at least pretend to depend on, if only for 120 minutes in a theater. Richard Reynolds looks at it another way, calling superheroes “A Modern Mythology.” The heroes of the comics go through death and rebirth. They stride across the decades in different forms - Black Widow was once a villain, and Thor has become a female. Like Zeus, they change to fit the story. Batman was a campy TV icon in the 60’s, reborn as a Gothic Dark Knight in the 80’s and 90’s. It’s the same with Superman himself, who was relegated to Frosted Flakes commercials in the 50’s. All of this makes me wonder what new versions we’ll see in the future. 1. Watchmen by Alan Moore – If you haven’t read this graphic novel, listed as one of the top 100 most important novels, run to get a copy. Its multi-layered story with graphics mirroring and expanding the text is amazing. The section set on Mars made me gasp when the ‘camera’ panned out. Plus I have a little bit of a crush on Dr. Manhattan, so there’s that. 3. Get In Trouble by Kelly Link – Link’s collection of New Weird stories takes the trope of heroes to a strange place. Writing about pocket universes and Egyptian pyramids, Link always delivers the unexpected and unforgettable. 4. Don’t expect Jon Snow or King Joffrey to appear in this mosaic edited by G.R.R. Martin, part of the Wild Cards series. The stories in Wild Cards are set in a parallel universe, which was created during the Wild Cards virus in World War II. If you enjoy the first one you’re in luck – the series has many volumes to entertain you. There are no classic superhero rescues and triumphs – instead, the authors serve up more literary, thoughtful fare. 5. Want a school for superheroes? Try Chance Fortune and the Outlaws. Joshua has always wanted to be a superhero. Too bad he doesn’t have any powers to offer. With a great deal of chutzpah and a lot of lies, he reinvents himself as Chance Fortune and enters Burlington Academy for the Superhuman. Recommended as a novel for adolescents and adults alike, this is the Harry Potter entry in the superhero universe. 6. Soon I Will Be Invincible – I’ll let the opening paragraphs tell the story: "This morning on planet Earth, there are one thousand, six hundred, and eighty-six enhanced, gifted, or otherwise superpowered persons. Of these, one hundred and twenty-six are civilians leading normal lives. Thirty-eight are kept in research facilities funded by the Department of Defense, or foreign equivalents. Two hundred and twenty-six are aquatic, confined to the oceans. Twenty-nine are strictly localized--powerful trees and genii loci, the Great Sphinx, and the Pyramid of Giza. Twenty-five are microscopic (including the Infinitesimal Seven). Three are dogs; four are cats; one is a bird. Six are made of gas. One is a mobile electrical effect, more of a weather pattern than a person. Seventy-seven are alien visitors. Thirty-eight are missing. Forty-one are off-continuity, permanent emigres to Earth's alternate realities and branching timestreams. "Six hundred and seventy-eight use their powers to fight crime, while four hundred and forty- one use their powers to commit them. Forty four are currently confined in Special Containment Facilities for enhanced criminals. Of these last, it is interesting to note that an unusually high proportion have IQs of 300 or more--eighteen to be exact. Including me." 7. I always like to include an Indie in the list. This month’s entry is Jim Bernheimer, who’s doing great things with his D-List Supervillain series. You can read the first one, Confessions of a D-List Supervillain, here. Technically the main character is a villain, not a hero, but Calvin (aka Mechani-Cal) is pretty heroic as well. Bernheimer writes with verve and assurance about The Olympians, his super-group, and Calvin himself. These should tide you over until we get more Captain America and Hawkeye in our lives. In the meantime, what are your favorite superheroes, and why? Girl Who Reads is an Amazon advertising affiliate; a small commission is earned when purchases are made at Amazon through the above links. Thank you for supporting this blog. Great article, Alison. I think perhaps as well as the sociological aspects of the superhero boom, there is the quality of cgi effects to also thank. I loved the hero boom of the early 80s- hulk, Spider-Man, Wonder Woman , but the effects look a bit naff by modern standards. The turning point for me was Raimy's Spider-Man trilogy, although Burtons Batman was equally cool.